7-Zip for Windows Mobile is a file archiver with a high compression ratio. 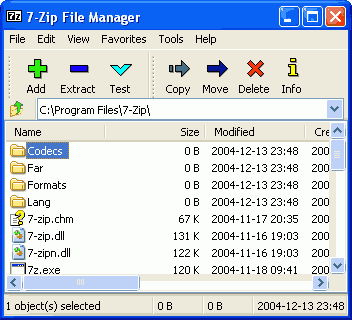 features of 7-Zip for Windows Mobile: High compression ratio in new 7z format with LZMA compression. Supported formats: Packing / unpacking: 7z, ZIP, GZIP, BZIP2 and TAR; Unpacking only: ARJ, CAB, CHM, CPIO, DEB, DMG, HFS, ISO, LZH, LZMA, MSI, NSIS, RAR, RPM, UDF, WIM, XAR & Z. 7-Zip provides compression ratio that is 2-10% better than ratio provided by PKZip & WinZip. 7-Zip for Windows Mobile is a file archiver with a high compression ratio. Qweas is providing links to 7-Zip for Windows Mobile 9.22 Beta as a courtesy, and makes no representations regarding 7-Zip for Windows Mobile or any other applications or any information related thereto. Any questions, complaints or claims regarding this application 7-Zip for Windows Mobile 9.22 Beta must be directed to the appropriate software vendor. You may click the publisher link of 7-Zip for Windows Mobile on the top of this page to get more details about the vendor.